Erik Spindler is currently working on migration from the Low Countries to England, in the 14th and 15th centuries. He is particularly interested in cultural and social aspects of this migration: why did this migration take place, how was it perceived and what impact did it have on migrants? how did host communities change as a result of immigration, and what consequences did emigration (and return migration) have on communities of origin? 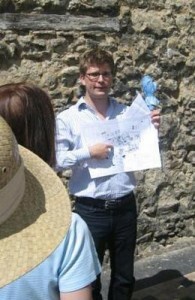 Between 2008 and 2010, Erik pursued this research project as a postdoctoral researcher in the urban history research unit at Université Libre de Bruxelles in Brussels. This year (2010-11), his status and activities are more confusing and varied, though his research focus remains unchanged. He also continues to be based in Brussels, which offers plenty of opportunities to read about past migrants in archives and libraries, and to observe live migrants in their natural habitat. Previously, Erik read history at the universities of Durham (BA 2002), Dublin (MPhil 2003), Louvain-la-Neuve (DEA 2004) and Oxford (DPhil 2008). His thesis dealt with marginal social groups in late medieval London and Bruges.